Former Husky receiver Damore’ea Stringfellow has a shot at a contract. How the Seahawks will use Shaquem Griffin. Can new punter Michael Dickson really dropkick? The Seahawks concluded their three-day rookie mini-camp at the VMAC in Renton Sunday afternoon. The camp included the team’s nine draft picks and 15 undrafted free agent signees as well as roughly 50 players who took part on a tryout basis. Here are five things that stood out, in no particular order. If that name sounds familiar it should. Stringfellow was a heralded member of the University of Washington’s recruiting class of 2013, the last for former head coach Steve Sarkisian. But after catching 20 passes for 259 yards and a touchdown as a true freshman he was suspended from the team the following winter after being charged with three misdemeanors as a result of two altercations following the Seahawks’ Super Bowl win over the Denver Broncos. He ultimately pleaded guilty to two counts of fourth-degree assault and another of third-degree mischief in altercations that erupted during Super Bowl celebrations. Stringfellow was accompanied that night by then-UW quarterback Cyler Miles, a Denver native (Miles was not charged in connection with the incidents). Stringfellow talked about that night in an interview with The Seattle Times last spring. He transferred to Ole Miss where he played two seasons and then declared for the NFL draft following the 2016 season. The Seahawks were interested in him then, bringing him in for one of the team’s 30 official pre-draft visits. But Stringfellow went drafted, and then signed with the Dolphins, spending all of training camp there before being waived and signed by the Jets, spending the season on their practice squad. He was then waived by the Jets April 27 and the Seahawks — on a perpetual quest for big receivers — brought him in this week for a tryout. At a listed 6-2, 218 pounds, Stringfellow would be as big as any Seattle receiver when combining height and weight other than Tanner McEvoy. Since Stringfellow is a veteran and could immediately join Seattle’s offseason program, he could be officially signed to a deal immediately. The Seahawks would have to waive someone off the 90-man roster to make that move. Seattle could waive a receiver or someone from another spot — the Seahawks have 10 receivers on their roster but have often had more than that heading into training camp. Receivers, including Damore’ea Stringfellow, catch passes during Seahawks rookie mini-camp. Somewhat overshadowed in the emotion of Seattle’s drafting of Griffin was the team’s statement that it planned to try him at weakside linebacker, an inside spot that currently is held by veteran K.J. Wright. While Griffin was used in a lot of different ways during his college career at Central Florida, he played primarily at outside linebacker or safety. But Seattle wants to try him at WLB where he could back up Wright for now and maybe serve as an option down the road with Wright entering the final year of his contract. Three days of non-contact practices hardly proves everything, but Carroll said the early impression is that Griffin will be a good fit inside. It’s no secret the Seahawks want to get back to being a physical, running team in 2018. And that also likely means adding a more traditional fullback to the offense than the Seahawks had in 2017, when they spent most of the year with Tre Madden, a former college tailback who is listed at 235 pounds. Seattle also signed former Titan Jalston Fowler (5-11, 254) to the practice squad last season and then to the 90-man in the offseason. Seattle signed two more fullbacks as undrafted free agents — Hill, from Michigan, and Marcus Martin, from Slippery Rock. Hill didn’t take part in many drills during mini-camp while nursing a pulled muscle. But simply walking around, the 6-2, 263-pounder — nine pounds more than any of the other three — looked the part of the kind of fullback Seattle needs to get back to the style it wants to play. Could Michael Dickson really dropkick? Dickson, a fifth-round draft choice out of Texas, became the first punter drafted by Seattle since 2006. The Seahawks said one attraction to Dickson was the wide variety of ways he can punt the ball due to his Australian Rules Football/rugby background. He showed plenty of that during mini-camp with daily competitions in which players at other positions were tasked with catching his punts. But most eye-catching were the handful of times the Seahawks had Dickson try dropkicks as field goals and point-after-touchdowns (in part because there was no apparent holder in camp other than Dickson himself). Drop kicks, defined in the NFL rule book as “a kick by a kicker who drops the ball and kicks it as, or immediately after, it touches the ground’’ are rarely attempted, with the last successful one coming in 2006 by Doug Flutie, and before that not done since 1941. Dickson first has to beat out incumbent Jon Ryan for the job. But his draft standing and the early impression he left seem to make that more likely by the day. Jones, the only offensive linemen the Seahawks selected in the draft at number 168 overall, played only tackle at Ohio State, He started 27 straight games at left tackle his final two seasons and said on the day he was drafted that he also played some right tackle earlier in his career. Carroll said last week the Seahawks would try Jones initially at left tackle. But Sunday Carroll said the Seahawks will try Jones at both guard and tackle going forward. Jones potentially being used at guard is obviously interesting since the Seahawks seem to have more immediate need for competition and depth at guard than at tackle, assuming George Fant has no setbacks as he continues to recover from the knee injury he suffered last August. The Seahawks have D.J. Fluker slated for right guard and Ethan Pocic at left guard. But the only other guards on the roster are Jordan Roos, Rees Odhiambo and undrafted free agent Skyler Phillips. Seattle might also consider using undrafted free agent center Brad Lundblade at guard. Lundblade was solely at center at Oklahoma State but got a few snaps at guard during the rookie mini-camp. 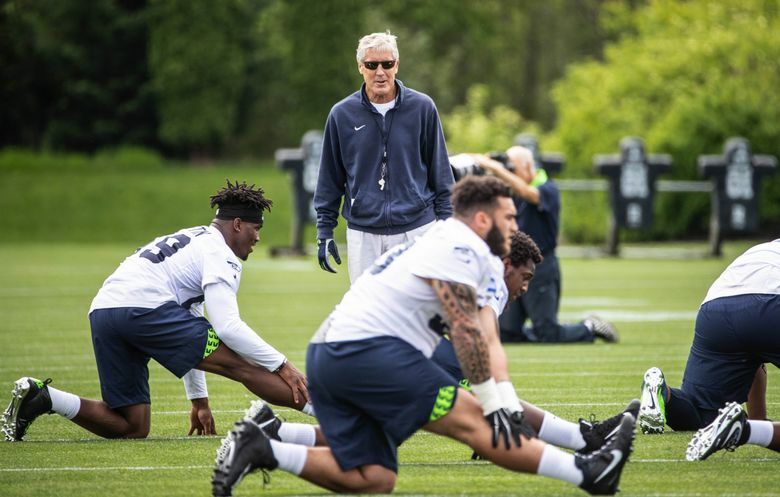 Seahawks coach Pete Carroll recaps the team’s rookie mini-camp Sunday.